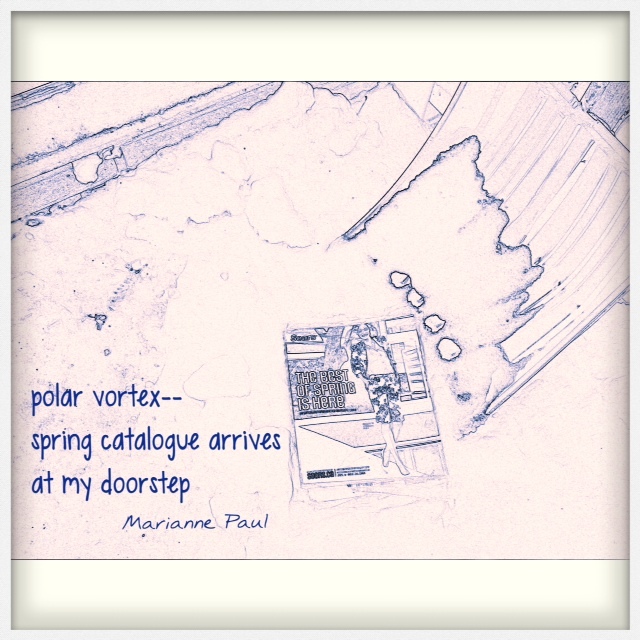 I suspected that mustering haiku poets to write lots of polar vortex poems would act as a kind of voodoo spell to chase the polar vortex away and it looks like I was right, because the temperature has actually been above freezing here for several days in a row and I’m not sure that’s happened since early December. Of course, we’re well into March now so I suppose it’s just barely conceivable that it would have warmed up eventually anyway, but I’m going with the “breath of poetic fire” theory. I hope it’s warmer where you are, too, or cooler, or wetter, or dryer, or whatever condition is most desirable meteorologically wherever you reside. Thanks to all who contributed for helping out! Polar vortex even a whisper is too loud. polar vortex cracks in moon blues. I liked your last one. Yeah, I figured you would. looking at this week’s forecast (um, snow) I’m wondering if maybe we should all join hands and repeat “polar vortex” three times in the mirror. Powerful magic greatly enjoyed – thank you for this talented and entertaining read.